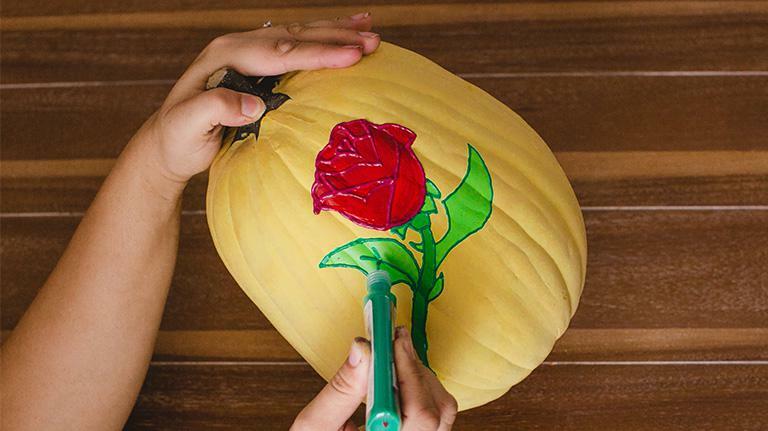 Pumpkins aren’t just for ferrying Cinderella to the ball; they’re also great for getting your kiddos into the Halloween spirit the Disney way! 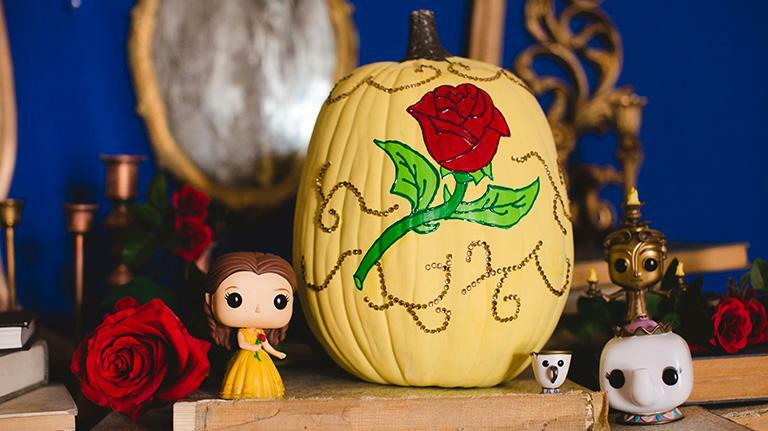 Best of all, everyone can join in the fun with kid-friendly designs inspired by Cinderella’s dreamy carriage, a not-too-scary Maleficent, and, of course, the rose and Belle’s iconic gown from Beauty and the Beast. October 31st is rapidly approaching, so ditch the carving knives, grab your paintbrushes, and let’s get started with everyone’s favorite Beauty! 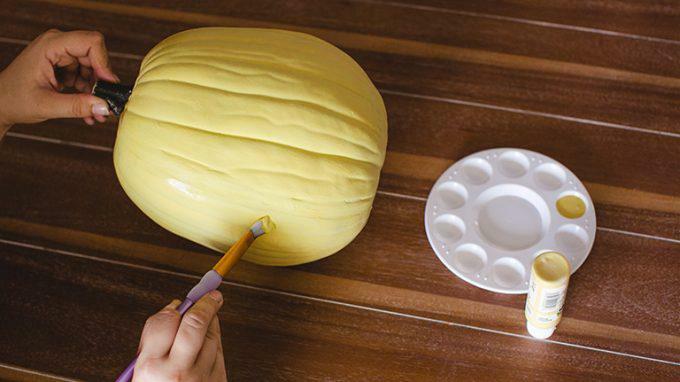 Base coat: Paint the entire pumpkin yellow, then allow to dry. 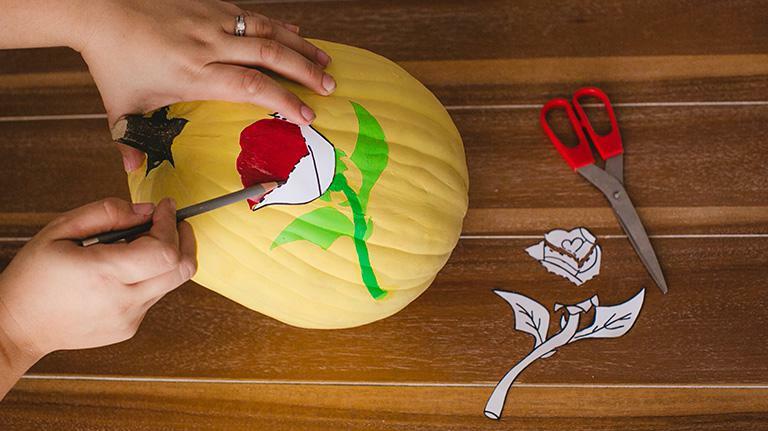 Template 1: Cut out the rose from the provided template and pin it to the pumpkin. Trace with a pencil. 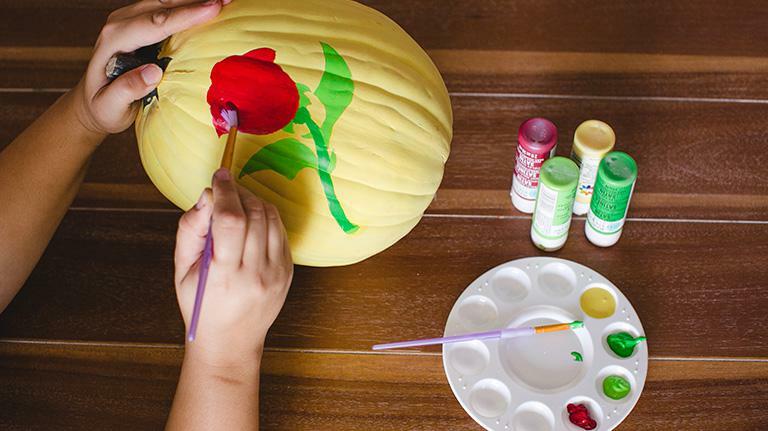 Rose base: Paint the rose head dark red, leaves and thorns light green, and stem dark green. Allow to dry. Template 2: Cut the rose template along dotted lines. 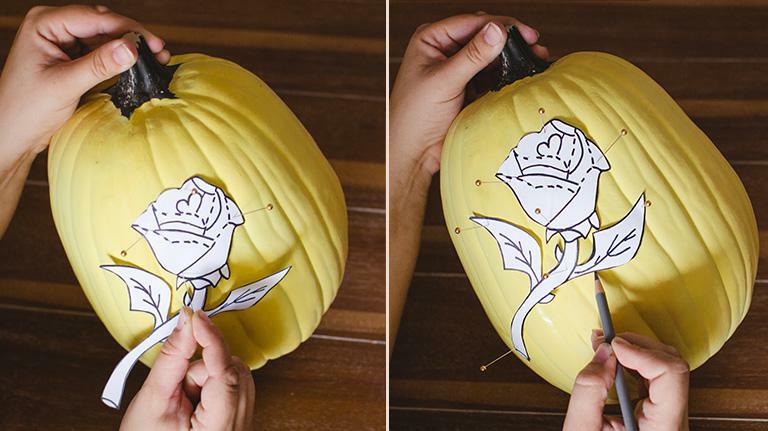 Trace each section into the rose head with pencil. 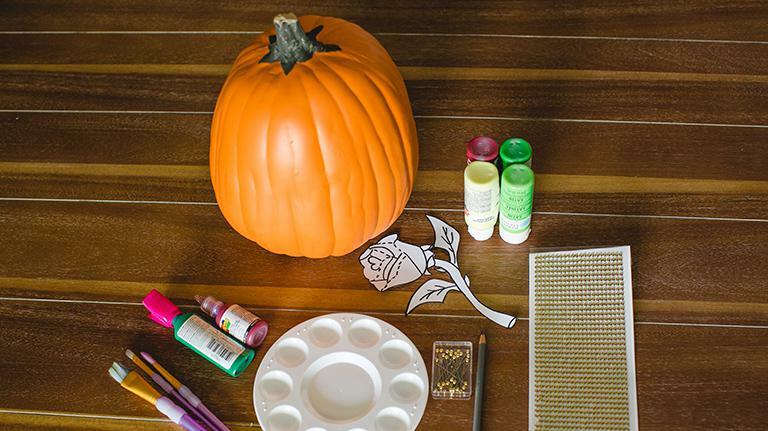 Outline: Outline the new rose lines with dark red dimensional paint, the stem and leaves with dark green. Interior detail: Using dimentional paint, freehand the rose’s interior lines and leaf veins according to the model pumpkin. 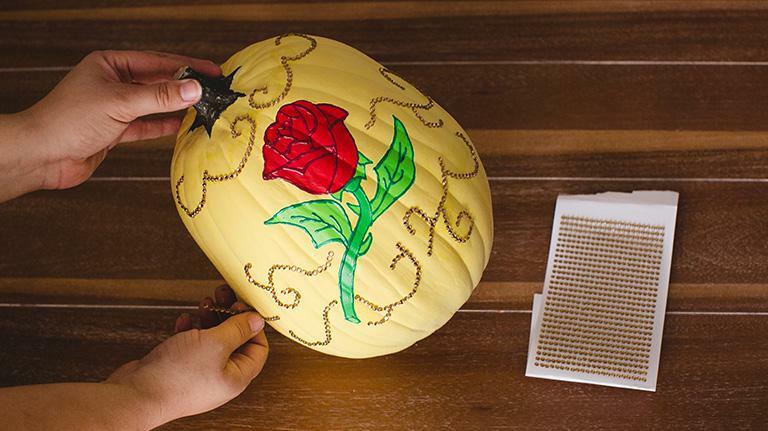 Rhinestones: Place self-adhesive rhinestones on the pumpkin in a swirl pattern, using the model pumpkin as a guide. Display: Put the pumpkin on a pedestal and surround with some of your favorite Beauty and the Beast products from Disney store. Now you’re ready to show off your creation in your castle’s West Wing! Don’t stop at “Boo!” when you can Bibbidi-Bobbidi, too! Convert your very own unassuming gourd into a glistening carriage headed for Halloween fun (no wand required!) 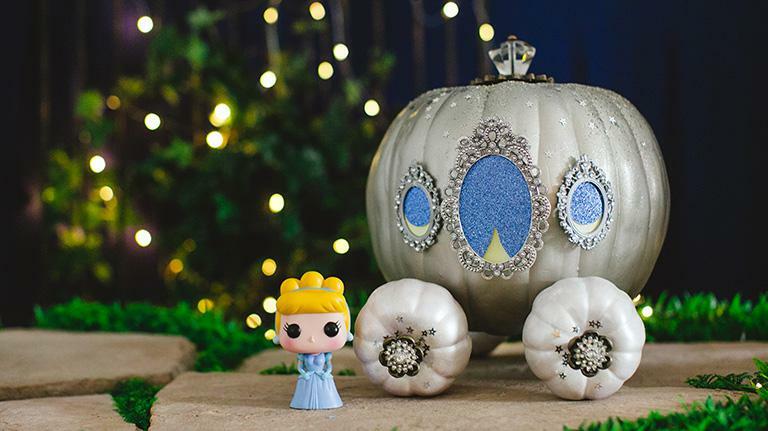 Paint your Cinderella pumpkin silver, then glue mini picture frame windows and cardstock curtains to one side. Skewer four smaller white gourd wheels, two on each side of the pumpkin, dust it with glitter, and then top the whole thing off with a decorative finial for a stem. And don’t forget to grab some Cinderella merchandise to place next to her carriage! Every Halloween needs a villain and this Mistress of Evil fits the bill without scaring off the neighbors. 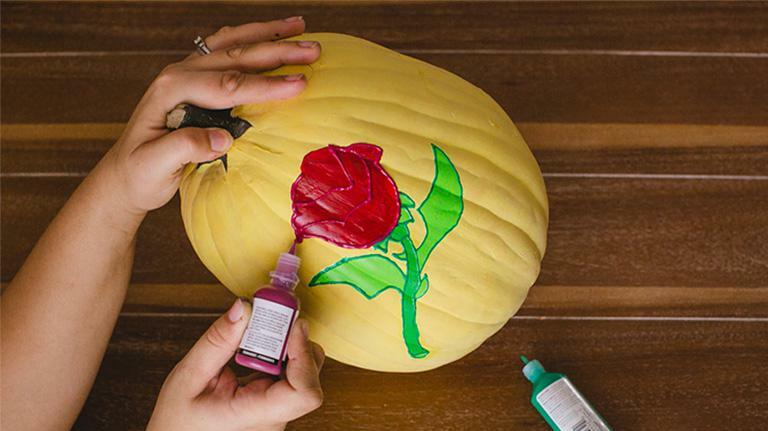 First, cut off the stem and then paint your pumpkin green and black. 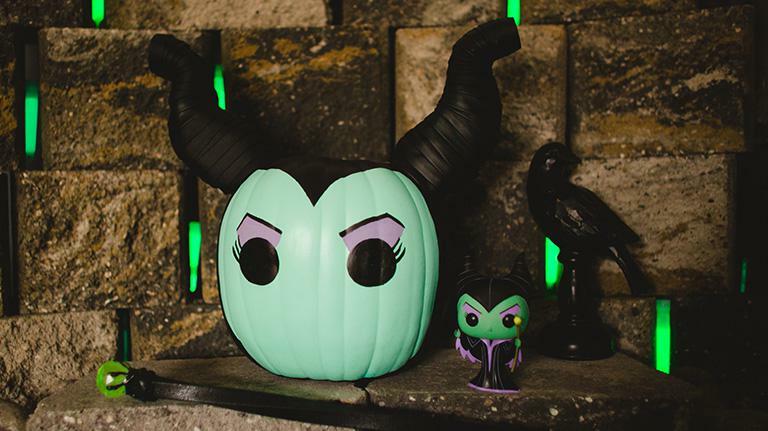 Add a stylized face inspired by Maleficent products at shopDisney.com. Cut Styrofoam into horn shapes, wrap them in leather ribbon, and hot glue them on for a sinister finishing touch. This glaring gal will be happy to stare down late-night trick-or-treaters long after your little Sleeping Beauties have gone to bed. As always, Disney® Visa® Cardmembers can redeem Disney Rewards Dollars toward Disney store purchases.1 If you haven’t joined the Cardmember family, learn more about how Disney Rewards can help you make your Disney dreams come true at Halloween and throughout the year.